We are a family-owned and operated winery producing high quality organic wine, located in the city of Plasencia, next to Valle del Jerte and at the foothills of Sierra de Santa Barbara. 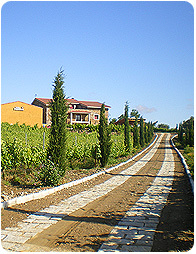 The wines of Viña Placentina are unique with their own personality, a result of a careful elaboration process that always uses the most suitable natural resources at all times. Our winery invites you to enjoy the culture of organic wine through our offering of wine tourism.